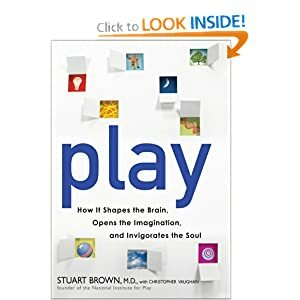 play: How It Shapes the Brain, Opens the Imagination, & Invigorates the Soul is a book written by Stuart Brown, a medical doctor, psychiatrist, clinical researcher, and founder of the National Institute for Play. I first saw Dr. Brown at the TED.com website, a site that features inspirational talks on a variety of topics under the general headings of technology, education, and design (hence T.E.D.). Play is divided into two sections: why play? and living the playful life. Dr. Brown defines play as “an absorbing, apparently purposeless activity that provides enjoyment and a suspension of self-consciousness and sense of time.” Play is a behavior observed throughout the animal kingdom. Animals use play to learn new skills and to test the limits of their societies. As Dr. Brown notes, we, as humans, are the same. To illustrate the importance of play, one story is about a company whose leaders observed that younger scientists were unable to demonstrate the same level of creative problem solving that their older peers displayed. Interviews with all of the scientists revealed that the older, more creative scientists had explored their world through play, in the form of manipulating objects with their hands, as children. As Dr. Brown walks us the through the importance of play in parenting, work, relationships, and in the world at large, the overall theme is clearly that we should adopt an attitude of play in all aspects of living. An attitude of plays leads to better work performance, personal relationships at a richer and deeper level, and more well-rounded children and students. When is the last time you played at work? How did this improve your productivity or effectiveness?